My friend Judy is hosting over at Stamp TV this week however, I am cutting it close as the challenge ends tonight. Her technique that she asked us to try is called Bargello and I had not heard of it before. HERE is a link so you can watch Beate Johns, over at Split Coast Stampers, do this fun technique. All you do is cut some strips of patterned paper, glue them on a backing, then cut that into strips across the “grain” and stagger them to form a Bargello pattern. It really is not difficult and a lot of fun! I am not sure my papers are pattern enough, I couldn’t find a yellow that would work, but I am pretty happy with the results. 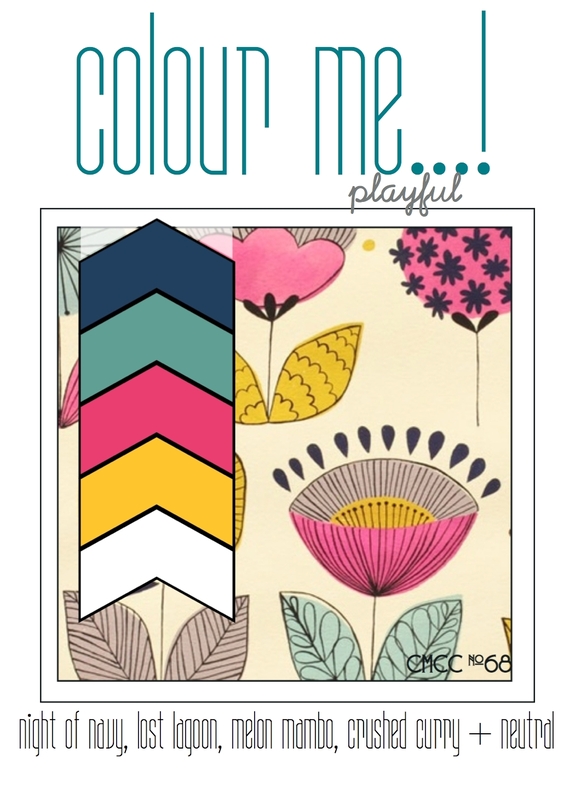 Before I began I went looking for a color challenge out in the blogosphere and came across this beautiful color combo over at Colour Me and was excited when I hadn’t missed the deadline. The stamps I used are all Gina K Designs, Hugs and Prayers and the sentiment is from the Wild West set. It’s the perfect size Happy Birthday that I was looking for. I also used my MS leaf punch and paper pieced the flower and gave it some dimension. I colored the butterfly poorly with colored pencil. 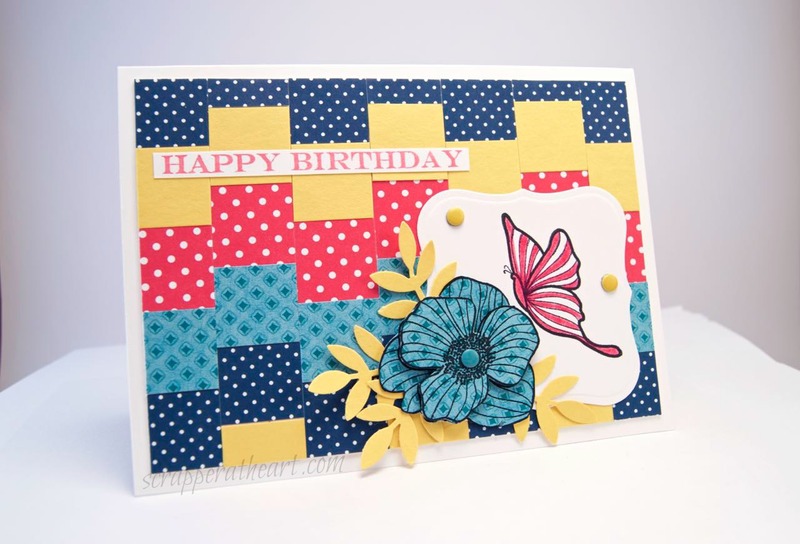 Categories: Cards | Tags: bargello, Card making, Cards, color challenge, Gina K designs, Happy Birthday, rubber stamps, stamping | Permalink. I love your beautiful background and it makes a beautiful card too. Isn’t that fu to do? I like the papers you chose too! Pretty bold card! Glad you picked up another Challenge along the way! 😉 I thought this was going to be a difficult one, but it wasn’t as scary as I thought! lol Have a happy day! Bargello is actually a quilting pattern, Nancy, made pretty much like Beate did and ranging from simple to fabulously creative designs. You have a great start with your card, and your flower fits in well with it. Oh, this card is just so stinkin’ cute!! I love the papers you have chosen, as well as the images you have used. Paper piecing that flower is genius – I really like the effect!! and your butterfly is the perfect final touch. Well done!! Great colors in your lovely card. You did a great job with this technique. I have never tried this technique either. Awesome use of pattern then pattern again 😉 — Love the colors together – you did a fabulous job at this challenge! You made that look easy! What a Beautiful card! What a fun patch work project 🙂 I love the wee butterfly as well! Thanks so much for taking the time to stop by, we sure hope to see you again soon!!! Beautiful patterns! What a great technique. I have never heard of this technique but I love the look of it! What a cool way to mix up some patterns! I have never done this technique but you have done an amazing job on it! Beautiful pattern paper it looks like a beautiful quilt!